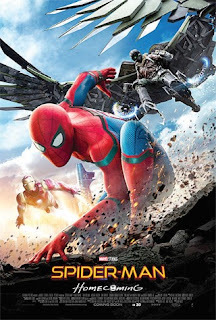 "Spider-Man: Homecoming” is the sixteenth installment in the ever growing Marvel Cinematic Universe and the second reboot for the iconic web-slinger, following the two “Amazing Spider-Man” movies starring Andrew Garfield. While I enjoyed those films upon first viewing, most critics did not feel the same way. The attempt at a new series was considered a failure and Sony ended up agreeing to a new deal that would allow them to share the rights to the character with Marvel. Soon after, the young Tom Holland made his debut as Spider-Man in 2016s “Captain America: Civil War.” This marks his first standalone feature. “Homecoming” serves as a fairly episodic Marvel chapter, taking place just a few months after the events of “Civil War.” This movie puts aside a total rehash of Spidey’s classic origin story -as there is really no need to see that done yet again. By working around those plot points, this new movie focuses primarily on Peter Parker’s challenges of balancing his high school life with his alter-ego. Additionally, he faces the threat of the Vulture (Michael Keaton) while constantly looking to prove himself worthy of officially joining his mentor, Tony Stark (Robert Downey Jr.) and the rest of the Avengers. After seeing “Civil War,” I was completely sold on Tom Holland as Spider-Man. To no surprise, he brings it once again in this movie; totally owning the role. I would add that it was nice to see a younger version of Spider-Man that is more accurate to the comics than previous, on screen incarnations of the character. While Holland may be my favorite Spidey yet, Michael Keaton was equally impressive as the Vulture. It is no secret that the Marvel Cinematic Universe struggles with their antagonists, but this has to be one of their strongest villains to date. Overall, I had a great time with this movie. There is plenty of exciting action and an equally intriguing story to go with it. The film is a much needed fresh start for the famous character and yet another worthy installment for Marvel. There was enough integration with the rest of the universe, but at the same time, “Spider-Man: Homecoming” has plenty going for it to stand on its own as well. With plenty of “Iron Man”/Tony Stark all over the trailers marketing for this movie, I thought that it would turn into “Iron Man 4”, but luckily that was not the case and his few scenes actually contributed to the film. “Homecoming” is definitely one of my favorite Spidey flicks and a noteworthy contribution to Marvel’s unstoppable universe.